We’ve been hearing rumors about Samsung putting the fingerprint scanner below the screen since the development stage of Galaxy S8. When it didn’t arrive, speculations suggested the Galaxy S9 would finally have it, but now we have somewhat of a confirmation that the Galaxy S10 will come with the sensor under the OLED panel. 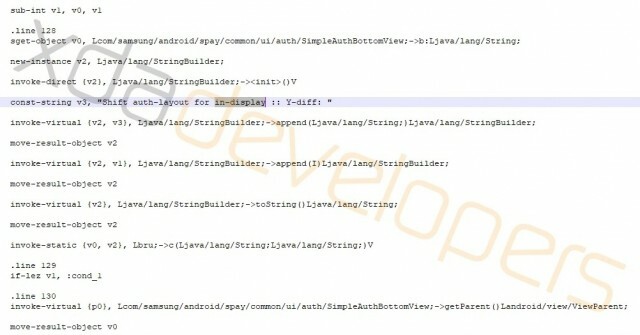 The source code of the Samsung Pay app was dissected by XDA-Developers, and it said “in-display FP scanner”. Apparently, when you choose to pay through the native application, the dialog box asking what type of security you’ll use, PIN or scanner, would move slightly upwards to make room for the finger to be scanned, when the latter option is chosen. Right now the variants are PIN or Iris scanner, but we already know Samsung will omit the IR sensor in the Galaxy S10.